In addition to nearly 500 objects on view in the Museum’s permanent collection galleries as well as rotating special exhibitions, the Art Museum and the Joseph Allen Skinner Museum combined are home to nearly 24,000 objects available to faculty and students for research and teaching. When choosing objects, please keep in mind that “less is more” when it comes to teaching with art. 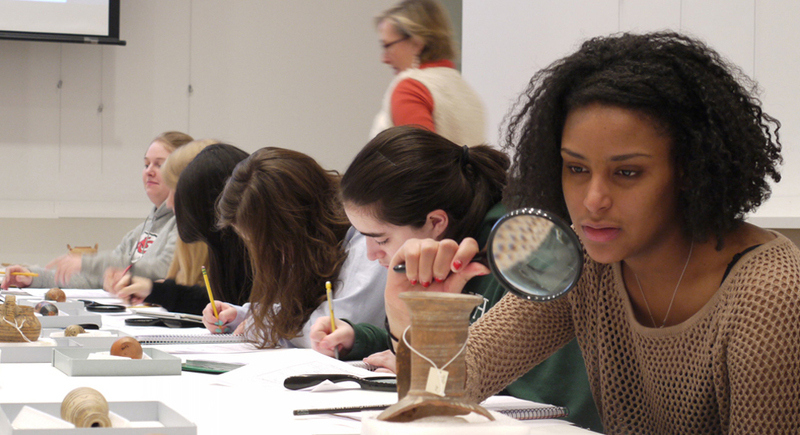 When students have time to consider art and material culture in more depth by focusing on a single work of art or a small group of objects for an extended period of time, we find that their visit has the greatest impact. Typically a range of 5-15 objects is ideal for study during a single class visit. For the safety of the art, a maximum of 15 objects from storage can be requested per visit.